Giving away another batch of vintage kid's books this week. 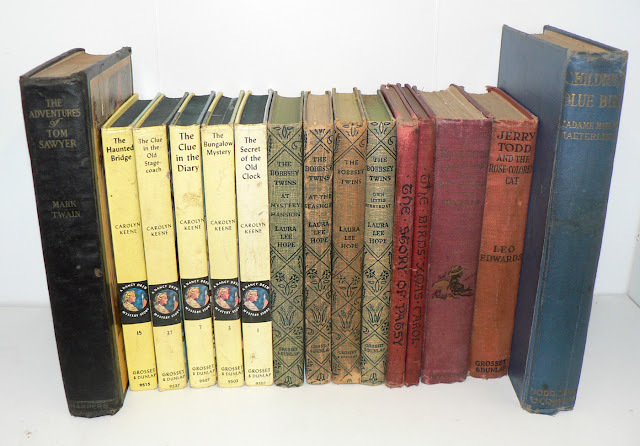 15 total books, some Twain, some Bobbseys, some Nancy Drew. Would love to win this for my niece! Thanks for the chance. Oh what lovely books. Can I have them? I thought I commented on Facebook, but then it didn't show up. These are lovely books! Nancy Drew really got me into reading when I was in the 5th grade. I remember some books my grandmother had - the Boxcar Children? Do you ever see those? I would love to win the Nancy Drew book for my granddaughter. Oh, Nancy Drew - such an awesome giveaway! I plan to raise my daughter on these books. Those are wonderful! 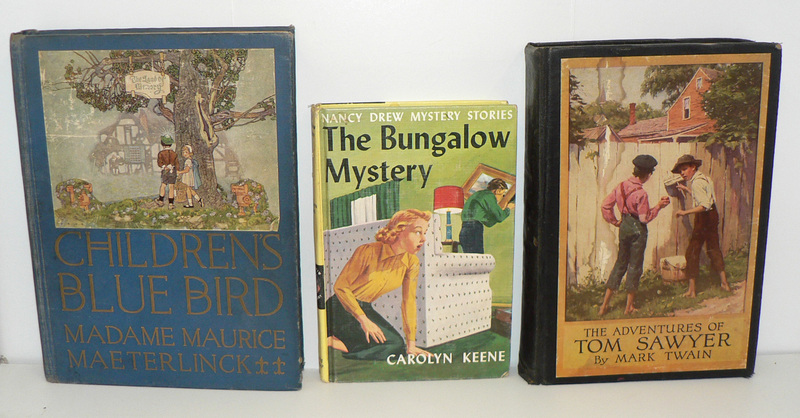 Nancy Drew was my favorite growing up. I did a report on The Secret of the Old Clock in 4th grade. Looks awesome. Would be happy to get them! It's Friday - is it also Myday? wow--Bobbsey Twins! Used to love those! I might be living in the wrong country (Sweden) but I'd love to win, old books <3 and to top that off my favourite Nancy Drew (Nostalgia!). I'd love to win these for my kids! Fingers crossed extra hard for this one!! I'd love to have these. I would love to add these to my children's library! Huge fan of children's books!!! I have two kids who would love to read these! could help out giving kids in my class more to read. For goodness sakes, I'm definitely in! I could use a pick-me-up. I love old books. I hope I win!! Thanks for offering this. I love old children's books. Please enter me! As a kid those were some of my favorites so count me in. I love reading with my nephews and these would be wonderful! Love, love, love kids books! Wow, the only thing we seem to ever ask for for our daughter are books. They are the one thing i trulynegative she can never have too many of. I would love to be on the receiving end of toy generosity, but regardless thank you for doing this. I just came across your site this week and LOVE it! !the forgotten bookmarks are inspired. I'm a middle school librarian. I would love to have these for my office. I would love these - loved Nancy Drew and the Bobbsey twins back in the day. I love old children's books! Thanks for the chance to win! Please count me in on this one, Michael. Oh, my...!!!!!!! Please, please, choose me!!!! Not only that I love children books and adore vintage, but have a little one who I learned the same! Keeping my fingers crossed!!! And - thanks for the chance!! This is very fitting since the opening ceremonies of the London Olympics highlighted children's literature tonight. Oooh vintage Nancy Drew! I'm definitely entering for this. I would love to start off my book collecting with children's books...back to where reading was discovered and anything was possible! Just started collecting. These are beautiful books. Wonderful collection. Please consider me in the give away. Thank you.